Acute pyelonephritis (AP) is the most severe form of urinary tract infection and often seen. Although associated with significant mortality with delay of treatment, AP is successfully cured without sequela by appropriate treatment in many cases. This time, we experienced a rare case of AP, followed by septic arthritis of the knee due to Escherichia coli. We must take care of septic arthritis of the knee although AP is a common disease, and this complication is extremely rare. We cannot find a case report like this clinical course. We herein report this case with rare clinical course. We report a 67-year-old woman with past histories such as dyslipidemia, hypertension, and osteoarthritis (OA). She had oral medication, such as amlodipine 7.5 mg/day, olmesartan 20 mg/day, rosuvastatin 2.5 mg/day. She was sometimes treated by hyaluronan-injection into the knees for OA at the nearby clinic. She also received hyaluronan-injection a few days before admission. In middle July 2014, she had complaints of fever and backache and was admitted to our hospital. On admission, her height was 157.0 cm and weight was 67.0 kg. Her physical examination revealed clear respiratory sounds and no cardiac murmur. Her abdomen was soft and flat. Right, costovertebral angle tenderness was positive. Body temperature was 38.6°C, blood pressure was 110/70 mmHg, and heart rate was 98 beats/min with sinus rhythm. Clinical laboratory data of blood and serum were as follows: White blood cell count, 13.5 × 10 3 /μL; red blood cell count, 424 × 10 4 /μL; hemoglobin, 13.1 g/dL; hematocrit, 36.2%; platelet count, 4.4 × 10 4 /μL; C-reactive protein, 28.48 mg/dL; total protein, 6.3 g/dL; albumin, 3.1 g/dL; glutamic oxaloacetic transaminase, 58 IU/L; glutamic pyruvic transaminase, 60 IU/L; total bilirubin, 1.0 mg/dL; lactate dehydrogenase, 456 IU/L; creatinine kinese, 252 IU/L; blood urea nitrogen, 81.5 mg/dL; creatinine, 2.85 mg/dL; sodium, 130 mEq/L; potassium 3.9 mEq/L; uric acid 12.3 mg/dL; corrected calcium, 8.4 mg/dL; phosphate, 2.8 mg/dL; activated partial thromboplastin time, 26.7 s (normal range 23.0-35.0); and prothrombin time international normalized ratio, 0.99; fibrinogen degradation product, 30.3 μg/mL. Urinalysis showed that the protein, occult blood, and leukocyte were positive. Abdominal computed tomography showed that right kidney was swelling, without hydronephrosis, hydroureter or stone [Figure 1]. We diagnosed right AP from these findings and started to treat with ceftriaxone 2 g/day empirically. In her clinical course, we changed antibiotics because liver enzymes elevated. We selected cefazolin 3 g/day with reference to the results of blood and urinary cultures which showed detection of E. coli and the antibiotic-sensitivity was good. However, 3 days after admission, she began to complain the pain and swelling of her right knee. We performed aspiration of the right knee-joint fluid, and the fluid was bloody. Light microscopy did not reveal sodium urate or calcium pyrophosphate. Knee-joint fluid culture also revealed E. coli. We diagnosed septic arthritis of the right knee and performed arthroscopic lavage on 11 days after admission, followed by continuous washout with saline for 7 days. She recovered from septic arthritis of the right knee and her renal function also recovered. [Figure 2] shows her clinical course. 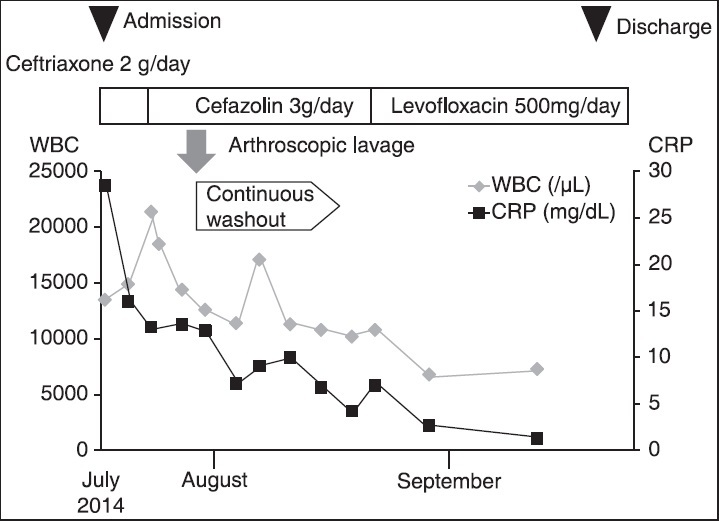 Antibiotics by dripping infusion were performed 33 days totally and changed to oral levofloxacin 500 mg/day. She was discharged from our hospital with the recovery of her knee, which showed "fair" by Ballard assessment. AP is a frequent disease entity which sometime causes critical status. Previous reports described that the mortality of AP patients ranged from 1.2% to 3.3%. , Many of causative organisms were Gram-negative bacilli, especially E. coli. However, many cases which are appropriately treated will be cured without sequela or complication. We cannot find out a case report which shows a case of septic arthritis of the knee due to E. coli secondary to AP in the literature. From these reports, septic arthritis of the knee due to E. coli secondary to AP is considered to be extremely rare. Although rare, septic arthritis from sepsis is important, and we must take care along with clinical course. In our case, we did not consider that hyaluronan-injection at nearby clinic cause septic arthritis subcutaneously, because the bacterium detected from knee-joint fluid culture was E. coli, that is same one detected from urinary and blood culture. It is important that the operation is performed without delay because delay causes more destruction of joints. In our case, we performed arthroscopic lavage, followed by continuous washout, and clinical course was good. We must take care of septic arthritis of the knee even in the course of AP if the patient complains knee pain. We experienced a rare case of septic arthritis of the knee due to E. coli secondary to AP. We have to take care of septic arthritis of the knee even in the course of AP if the patient complains knee pain. Lee JH, Lee YM, Cho JH. Risk factors of septic shock in bacteremic acute pyelonephritis patients admitted to an ER. J Infect Chemother 2012;18:130-3. Yoshimura K, Utsunomiya N, Ichioka K, Ueda N, Matsui Y, Terai A. Emergency drainage for urosepsis associated with upper urinary tract calculi. J Urol 2005;173:458-62. Stamm WE, Hooton TM. Management of urinary tract infections in adults. N Engl J Med 1993;329:1328-34. Chiu LQ, Wang W. A case of unusual Gram-negative bacilli septic arthritis in an immunocompetent patient. Singapore Med J 2013;54:e164-8. Bayer AS, Chow AW, Louie JS, Nies KM, Guze LB. Gram-negative bacillary septic arthritis: Clinical, radiographic, therapeutic, and prognostic features. Semin Arthritis Rheum 1977;7:123-32. Yu WL, Lin CW, Wang DY. Clinical and microbiologic characteristics of Ochrobactrum anthropi bacteremia. J Formos Med Assoc 1998;97:106-12. Kimura AC, Calvet H, Higa JI, Pitt H, Frank C, Padilla G, et al. Outbreak of Ralstonia pickettii bacteremia in a neonatal intensive care unit. Pediatr Infect Dis J 2005;24:1099-103. Mahmood MS, Sarwari AR, Khan MA, Sophie Z, Khan E, Sami S. Infective endocarditis and septic embolization with Ochrobactrum anthropi: Case report and review of literature. J Infect 2000;40:287-90. Ryan MP, Pembroke JT, Adley CC. Ralstonia pickettii: A persistent gram-negative nosocomial infectious organism. J Hosp Infect 2006;62:278-84. Balabaud L, Gaudias J, Boeri C, Jenny JY, Kehr P. Results of treatment of septic knee arthritis: A retrospective series of 40 cases. Knee Surg Sports Traumatol Arthrosc 2007;15:387-92.